University Of Engineering & Technology (UET) Peshawar Khyber Pakhtunkhwa. 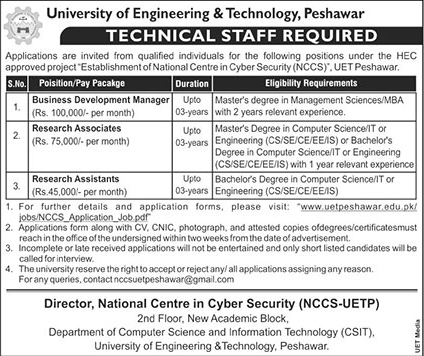 Applications are invited from qualified individuals for the following positions under HEC approved project " Establishment of National Centre in Cyber Security (NCCS), UET Peshawar. Further details and application forms, Please Visit. www.uetpeshawar.edu.pk. Application form along with CV, CNIC, photographs and attested copies of degrees/certificates must reach in the office of the undersigned with two 02 weeks from the date of advertisement. Incomplete or late received applications will not be entertained and only shortlisted candidates will be called for Interviews. University Of Engineering & Technology (UET) Peshawar.